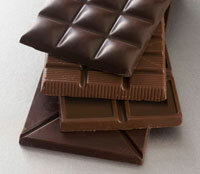 New research shows a small daily dose of chocolate can reduce the risk of heart disease by 40 percent. Researchers in Germany sent out questionnaires regularly to more than 20,000 people over a period of eight years. The same people were asked about their eating habits and exercise regimens. All the subjects followed had no history of heart problems and had a similar body mass index. Those that consumed about six grams of chocolate per day were less likely to have heart disease than those who did not eat chocolate, eFitnessNow reported. Eating 7.5g of chocolate daily also leads to lower blood pressure, a study found.Those who ate the most amount of chocolate - an average of 7.5g a day - had lower chances of heart attacks and stroke than those who ate the least amount (1.7g a day on average). The difference between the two groups amounted to 6g of chocolate - less than one square of a 100g bar. Of those who ate the least chocolate, there were 219 strokes or heart attacks per 10,000 people but there could be 85 fewer if they ate 7.5g a day on average, The Press Association news agency says. Although chocolate is known to reduce blood pressure, lower levels in chocolate lovers accounted for only a small part of the benefit seen in the study, Buijsse said lead researcher of the study published today by the European Heart Journal. Flavanols may add extra protection by boosting the impact of nitric oxide, a gas that relaxes smooth muscle cells lining blood vessel walls and helps reduce clotting, he said. "The substances in cocoa, flavanols, are making the blood vessels more elastic and less stiff," he said. That’s bad news for white chocolate lovers. "White chocolate doesn’t do anything, probably because it doesn’t contain any flavanols," he said, BusinessWeek reported.